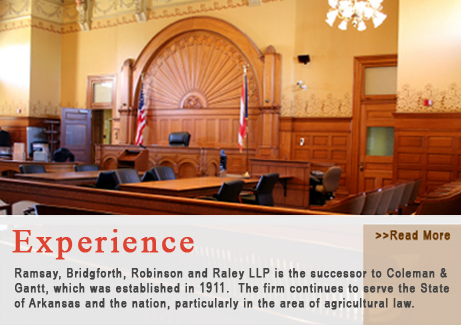 Ramsay, Bridgforth, Robinson and Raley LLP is the successor to the original firm of Coleman & Gantt, which was established as a general practice firm by W. F. Coleman and N. J. Gantt on March 1, 1911. Ramsay, Bridgforth, Robinson and Raley LLP currently represents clients not only throughout the State of Arkansas, but it also has regional and national representations in the areas of agriculture and labor law. 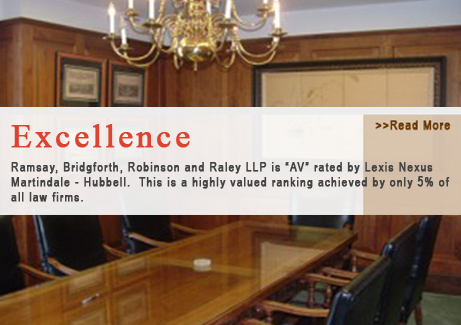 We are rated "AV" by Lexis Nexis Martindale - Hubbell. This is recognized nationally as a testament to the fact that the law firm’s peers rank the firm at the highest level of professional excellence. 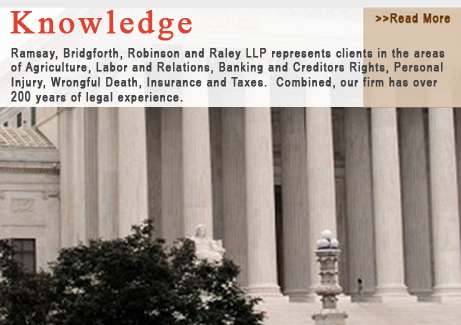 Copyright 2012 Ramsay, Bridgforth, Robinson & Raley LLP. All Rights Reserved.